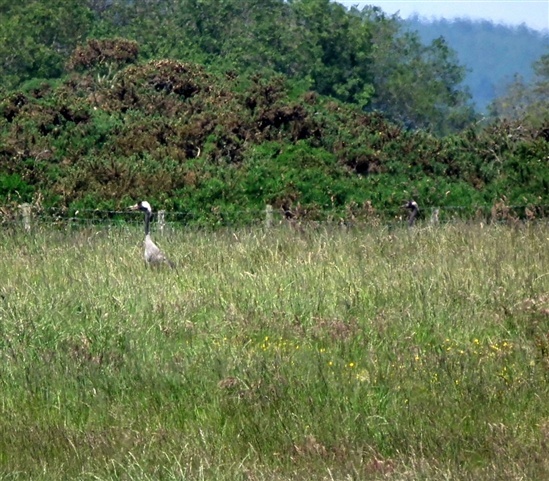 Common cranes have been an annual sight along the coast of Aberdeenshire for a number of years, during spring passage. However, breeding was only proven in 2012, when a pair nested and fledged one chick. 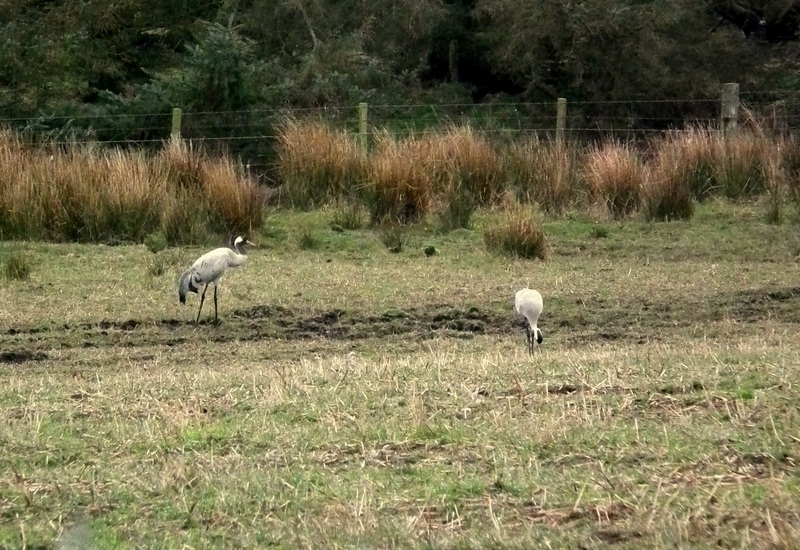 This was the first confirmed breeding attempt of cranes in Scotland for over 400 years! Even better, this pair decided to make the area their permanent summer residence (they migrate somewhere warmer for the winter), and returned this year for their seventh nesting attempt. I’ve been lucky enough to have been involved in monitoring their colonisation, since that first chick fledged: initially as a volunteer, and then as part of my role as RSPB Scotland’s Assistant Conservation Officer. Colonisation by cranes is a painfully slow process, according to a study of the Norfolk population where cranes first recolonised in the late 1970s having become extinct in the UK by the 1600s due to drainage and hunting. 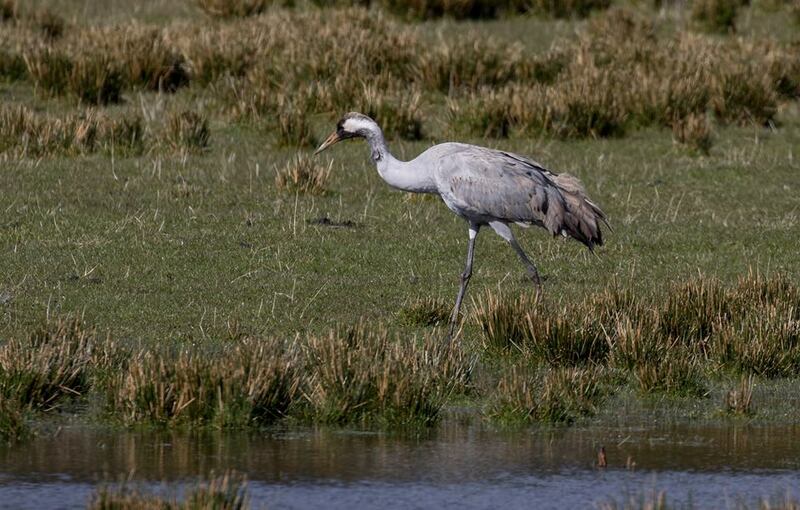 Wild cranes are now breeding in Norfolk, Suffolk, Cambridgeshire, Yorkshire and Aberdeenshire, and there are populations in Somerset, Wiltshire, Oxfordshire and Gloucestershire thanks to reintroductions through the Great Crane Project. But back to Aberdeenshire and Scotland’s only common cranes. Following, 2012’s success, in 2013, there were two other pairs hanging around the area, which didn’t appear to attempt to nest. By 2014, behaviour suggested that a second pair had nested at the edge of Pair 1’s territory, but the eggs failed to hatch. 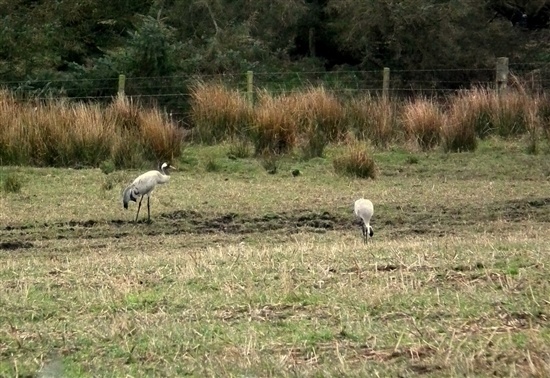 With a keen eye (and camera) it is possible to distinguish individual cranes by their plumage features, and unfortunately this second pair failed to return in subsequent years. So, in 2015, we thought we were down to one breeding pair again. 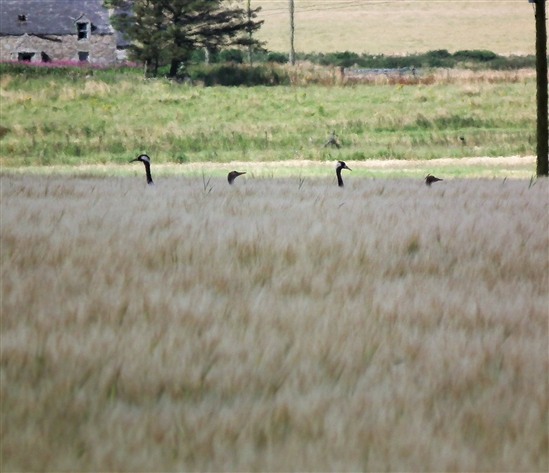 However, despite keeping an eye on other suitable areas, it turned out we had missed a pair breeding a few miles away. When this pair returned in 2016, a local resident got in touch to let us know. From the information gathered from several people in the area, it didn’t sound like they had bred that first year, until another local sent us a picture of a small chick. It seemed the poor chick didn’t survive for long, but still, the Scottish breeding population had doubled to two established pairs. A bigger disaster struck this new pair in 2016. Having returned to the area and hatched two chicks, the male parent disappeared, quickly followed by one of the chicks. Although the female managed, somewhat miraculously, to fledge the remaining chick alone, we had doubts as to whether she would return to the region with a new mate. Amazingly she did return in 2017, but she was, sadly, alone. Somehow though, her persistent calling meant that a new male managed to find her on her territory and they paired up, although it was probably a bit late in the season to nest. You may be thinking “how hard can it be to monitor a couple of pairs of noisy four-foot-tall birds?”, but the answer is actually “pretty difficult”. They are very sensitive to disturbance, particularly at the nest, so we must keep a good distance away, and they usually manage to find a dip in a field to hide in, a straw bale, or just stay far off the beaten track to evade detection. Even armed with six years of data on habitat preferences throughout the season, and knowledge of their preferred feeding areas, cranes can be really hard to find. During the few years when we could almost see the nest of Pair 1 from a distant vantage point, we saw that the off-duty bird would spend a lot of time standing near to the nest, whilst the other bird was incubating the eggs. A single bird would only occasionally fly off on a feeding trip and then return to the nest area an hour or so later, perhaps changing over with the incubating bird, which could then go off foraging, never leaving the precious eggs unattended. This year, pair 1 nesting, for a second time, behind trees was at least offset by Pair 2 choosing a more open location, although the nest itself was obscured by saplings. Monitoring this year began in mid-March, when Pair 1 usually turn up. It is never certain if we don’t see them whether they have arrived or not. 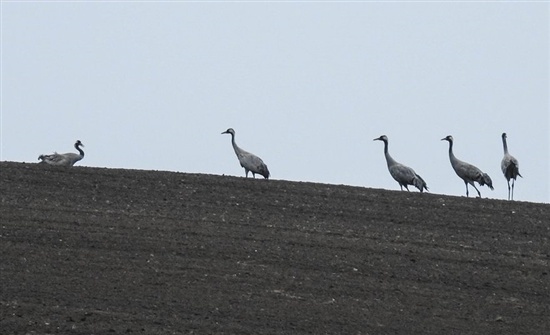 However, we had some information to help us this year, in the form of a sighting of two cranes flying north over Northumberland on 20 March, which was posted on a national rare bird alert. The following day, one of our volunteers was checking the site and the pair flew in, touching down at the pool on their peatland territory. So, we knew they’d arrived. Now all we had to do was keep track of them. After all, this pre-settlement period is the time to see their amazing courtship displays. Alas, I didn’t manage to find them until it was all over and they were already incubating their eggs. At least I managed to get an idea of where their nest was, as they flew in and out of the dense trees. Chatting to local residents filled in some of the blanks of what they’d been up to since their arrival: some very early morning calling going on nearby, followed by the pair mating on Easter Sunday, in front of the grandchildren. This information allowed us to narrow down the date the eggs would hatch, which is a month after laying. Although the widowed Pair 2 female arrived at the same time as Pair 1 last year, the newly formed couple were much later in 2018. Their arrival coincided with that of some non-breeders arriving at the RSPB Scotland Loch of Strathbeg nature reserve, and perhaps reflects the habits and wintering location of the new male. Even though they were late arriving, they didn’t seem to be in any hurry to breed. They were relatively easy to find during this pre-settlement period, feeding on barley grain, and they only began nest building near the time Pair 1’s eggs were due to hatch. A few days later the tell-tale sign of a single bird feeding indicated that incubation was finally underway. Pair 1 became elusive again during the second half of April, either they were feeding out of sight or were staying close to the nest during our visits. I didn’t see them again until 10 May, when their chicks should have been 4-6 days old. The parents were away from the nest together, near to where they tended their young chicks in 2017. 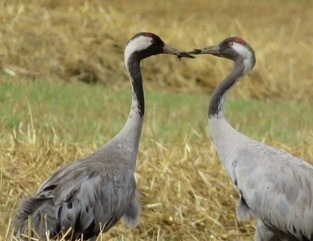 However, they were feeding in long grass, much taller than a recently hatched crane would be. I could tell by the way they remained in a small area that they did have young, but they were impossible to see. Even the adults disappeared behind trees for much of the time, and unfortunately, there are lots of deadlines to meet back at the desk of an Assistant Conservation Officer. The next day Hywel, our Senior Conservation Officer, had more luck and confirmed the presence of two ginger fluff-balls in the pasture. My next visit also featured occasional views of the adults’ heads in tall vegetation, with Hywel managing to see two chicks again in early June, still in the same area. By my next visit a field close to this preferred spot had been drained and topped, likely disturbing the family at this very sensitive time, causing them to retreat back to the safety of the peatland nest site, where they couldn’t be seen. During this time Pair 2 were readily visible, although mostly the off-duty bird was standing by the nest, rather than being found feeding in the surrounding fields. 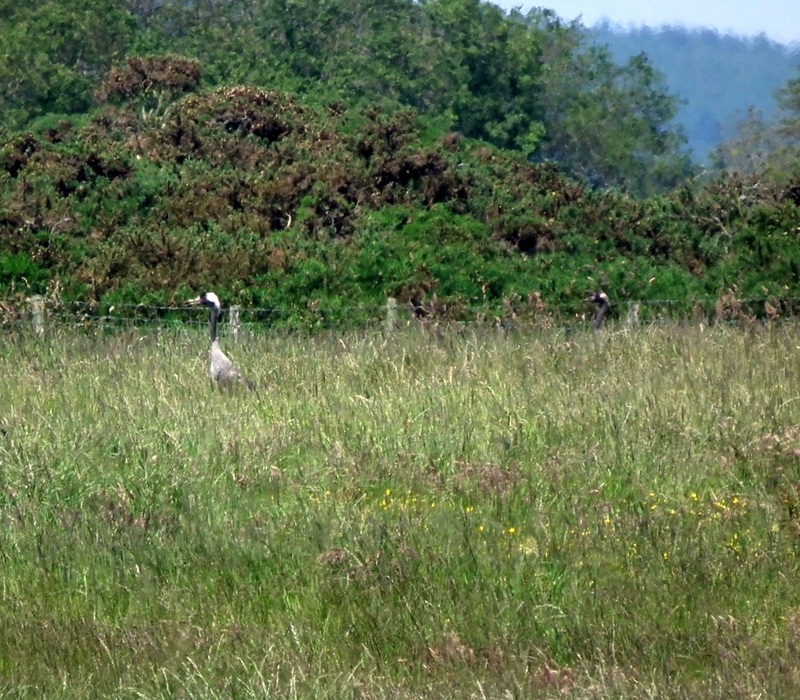 I finally managed to see a crane chick on 12 June, when it was aged 2-6 days. It looked likely that there was a second, but it wasn’t visible. Worryingly, the female parent was limping quite badly. I can’t imagine cranes would do well on one leg, so we had to hope she would recover. Of course, Hywel managed to see both chicks a couple of days later, remaining around the nest island, but the female was still limping. We had recruited a new volunteer, John, to help monitor this family, but he didn’t manage to see his first chick until the end of June, when they were down to one. Gladly though the female no longer appeared to be injured. By this time, the family had moved to the other end of their territory, to the silage field where the female had single-handedly raised her remaining chick in 2016. However, this year the family have spent most of July feeding on the peatland, instead of the surrounding farmland. At over 50 days old, the chick is now well grown, and looks more like a miniature adult, with fresh grey plumage, although views have been quite distant. It should be taking its first flight in the next two to three weeks, and is less likely to be predated/eaten by this stage. Pair 1, on the other hand, didn’t do so well. It wasn’t until 10 July that I found them again, and the signs weren’t good. They were in a field I’d found them in two years ago, after they had lost their young chicks and disappeared for a long while. This time I had found them after hearing them calling, which they wouldn’t do if they had chicks, unless a predator was approaching. I couldn’t see any chicks, but didn’t see the pair for long enough to confirm their loss. It was very hot and the heat haze made every rock look like it was moving. The pair would be having a siesta in the middle of a summer’s day, so I left them to it. The next day Hywel found them in the same place, but this time all he could do was confirm that the chicks were lost. The local residents had a very disturbed night’s sleep in late June, when the birds’ calling continued for over four hours. This was probably when the chicks were lost. There was some confusion around late June, as the five non-breeding birds that had arrived at Loch of Strathbeg turned up on the territory, making it difficult to positively identify the breeding pair and tell if they had lost their chicks. It was also strange that Pair 1 were never seen chasing away these intruders from their territory. There were so many sightings posted by the public of these and other non-breeding cranes, possibly eight different individuals, that we didn’t have to go and look for them to know what they were up to. As well as Loch of Strathbeg, these birds were seen regularly on the Ythan estuary, as well as near Drumoak, and some even went to Keith for a day. Interestingly, a pair seen recently near Pair 1’s territory had brown backs, suggesting that they may have attempted to nest: adults paint their pale backs with mud to camouflage themselves whilst incubating their eggs. 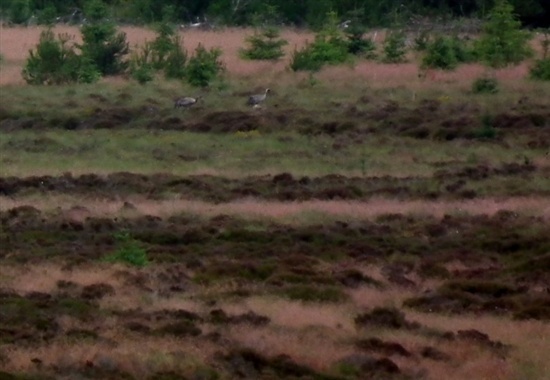 It is promising to have so many cranes summering in the region and we hope they like our peatlands enough to return to breed on them in the future. As difficult as it is finding cranes and their chicks, I wouldn’t complain if I had a few more to keep track of. We should probably also say that the area where the cranes nest is also home to breeding corn buntings, cuckoos, grasshopper warblers, grey partridges, kestrels, lesser redpolls, linnets and tree pipits. As well as supporting remnant populations of curlews, grey wagtails, lapwings, ringed plovers, shovelers and snipe. In this area, there is significant potential to create a truly inspirational landscape where wildlife flourishes alongside sympathetic farming and the whole area can be enjoyed by people for its landscape, cultural and historic value while providing benefits of carbon storage and improved water quality. What a wonderful project to be involved in, and to know that chicks have survived. Well done to all concerned.